The ASAO GRIKPIC grant for 2012 was awarded for printing and distributing 100 copies of a 281 page English-to-vernacular dictionary of six of Tanna's major languages. Numerous villages participated in "dictionary workshops" to compile the data. Kenneth Nehrbass, assistant professor of International Studies at Belhaven University, facilitated the project during his nine years of fieldwork with Summer Institute of Linguistics in Vanuatu. The multi-language dictionary has been popular on Tanna since many people are interested in maintaining their vernacular. Also, there is a movement in Vanuatu to promote vernacular education through at least second grade. This monograph can be used in elementary schools to stimulate vernacular education in the following ways: 1) It helps familiarize students with the "Tanna alphabet;" 2) it can help students (or educators) learn about their neighboring vernaculars; and 3) it can facilitate the integration of English with students knowledge of their vernaculars. By June 2012, 100 copies were distributed. One copy went to the National Archives, and another to the University of the South Pacific, Emalus campus library (see story below). 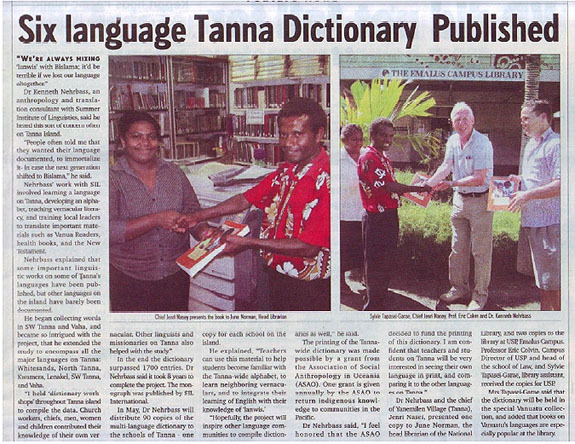 Story about the ASAO grant for Tanna's multi-language dictionary in the Daily Post. 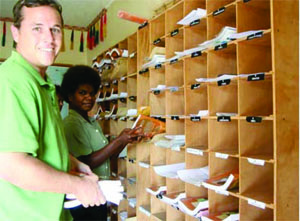 Administrators of the Tafea Education Office receive copies of the monograph. Distributing copies to each of the 90 schools in Tanna.